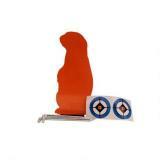 Made of high quality steel, the .22 Popper is rated for .22 caliber soft nose lead. Shoot the target and watch automatically pop back. No assembly required. Just stake the target in the ground with the stainless steel stakes that are provided and start shooting.